If you haven't really gotten into Google's Project Fi, the following deal might convince you to at least take a look at what it has to offer. While Amazon is running its Prime Day sale, Google offers $300 Project Fi service credit to customers who purchase two of its LG smartphones. 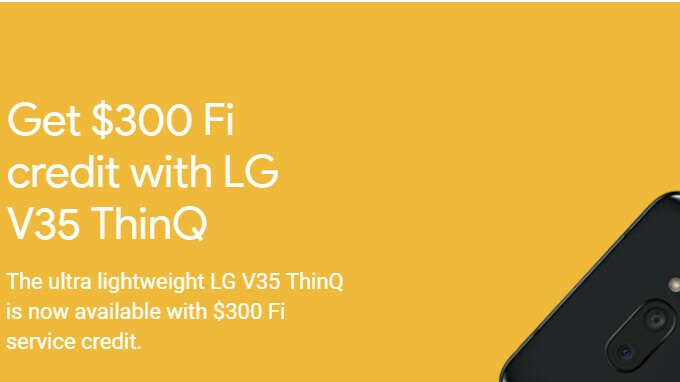 Although the announcement mentions that you can buy any LG phone available in its Project Fi portfolio, only two are eligible for this particular offer: LG G7 ThinQ and LG V35 ThinQ. They can be purchased for $749 and $899, respectively, a pretty high price, although not unusual considering both are top-tier phones. Once you buy either of the two LG smartphones and activate it on Project Fi, you'll receive the $300 service credit. If you're not convinced that the promo is worth your money, you have until July 29 to decide whether or not to go with Google's Project Fi.